ANAHEIM, Calif. — Although Troy Terry is only five games into his NHL career, he was already something of a shootout legend even before he arrived in Anaheim. When he got his first shootout opportunity for the Ducks on Monday night, Terry broke out the same skills he employed to win two enormous shootouts in the world junior championships last year. Terry sent the crowd home happy — with plenty of help from John Gibson, of course. 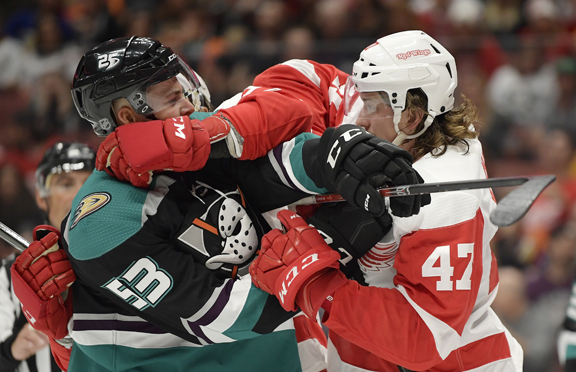 Terry scored the only goal in the shootout, Gibson made 19 saves and the Ducks celebrated the home opener of their 25th anniversary season with a 3-2 victory over the Detroit Red Wings. Jakob Silfverberg scored the tying goal with 11:31 to play, and Hampus Lindholm also scored as the Ducks improved to 3-0-0 for the first time since their 2006-07 Stanley Cup title season. Terry scored through Jimmy Howard’s legs in his fifth NHL game, and Gibson stopped all three Red Wings shooters. Tyler Bertuzzi and Darren Helm scored and Howard stopped 24 shots for the Red Wings, who are winless in their first three games. Detroit couldn’t hold two leads in a game between two young rosters getting NHL experience on the fly.